HEALED: For almost ten years, Marie Sande Karlsen had severe asthma. In 2007 she was healed. For almost ten years, Marie Sande Karlsen (87) from Oslo had severe asthma. Several times a month she had to go to the hospital for treatment. In 2007 she called Svein-Magne Pedersen and got a prayer. A shining healing changed the situation. -This is no problem. I often go for walks, but I don’t get tired, says Marie Sande Karlsen. We meet her in a good drive on our way up to Stensparken, located at Fagerborg in Oslo with views of parts of the capital. The road up is steep, and most would probably need a rest when they reached the top. Eight years ago, this would have been impossible for Marie, but as of today she can move without the lungs giving up. Around 1995 Marie Sande Karlsen started having lung problems. The situation only worsened, and she soon realized what had been bothering her. Several in the family suffered from asthma, and now she also became a victim of the same. In the year of 2000 asthma broke out and everyday life for Mari completely changed. -I could no longer be active as I was earlier, but I had to be, but I had to stay calm. Walking up hills or stairs was strenuous. Long walks were also challenging for the lungs. Instead, I used the car diligently. Occasionally I drove up to Holmenkollen where I sat down on a bench. There was fresh air and no smoke or exhaust. I could sit with a coffee and lunch while I knit and relaxed. Marie’s health only worsened. She was addicted to medicines and often used asthma spray and an atomizer apparatus. In addition, she went to the hospital to get cortisone. -For several years I was at the hospital one to two times a month to get the necessary medication. The suitcase was always pre-packaged. Sometimes it happened that I had postponed the hospital visit for too long. Then I could get so sick that I had to be transported to the emergency department in an ambulance. In the end, the ambulance driver was frustrated and said, "You have received my private number. I have said you should just call when you feel sick. Do not wait until you get that sick! " Marie still had some good periods during the year. Every year, the family went to warmer places where they lived for four months. Initially, they went to Spain and Turkey, but in recent years they stayed in Thailand. - It was nice with sun and warmth, and the lungs worked well, but of course, I did not participate in any activities. When we got home to Norway, it did not take long before the lungs were ailing again. Then I continued with medicines and new visits to the hospital, said Marie. Marie could not be in too much activity. Everyday consisted mostly of keeping calm. There were not many activities on the weekly schedule, and sometimes she was bedridden. After being in the hospital, she was often well for a week before she would get sick again. Then she had to sit and sleep to avoid being chocked by mucus of the lungs. Otherwise, she sat in the kitchen in a wheelchair. Then she could easily get around without having to get up and walk. -Occasionally I was so healthy that I could participate in the retirement dance. It was fun, but there were not many dancing steps before I had to ask for a break to breathe. In 2007, Marie phoned Svein-Magne Pedersen. She was now tired of this disease, which caused her to hardly ever get out to visit family and friends. The number she received from a acquaintance. The telephone attendant wrote down her prayer needs. She was told that Svein-Magne Pedersen was going to pray for all the prayer requests that came in. - A little later I sat in the kitchen with my eyes closed and relaxed. Suddenly I saw a strange light that moved over me. It was so peculiar, because I experienced not being in the kitchen even though I was. The light was high up, and it moved downward and spread out like a veil. I still had my eyes closed and did not dare open them because I was afraid it would disappear. It was indeed the most beautiful I had seen. After a while, I opened my eyes, and then I realized that the light was actually in the room. I went into the living room to see, but there was no light and I went back there. This lasted for several minutes. Marie does not remember much more, only that she woke up in bed at half past two at night. " -I did not know what time it was and I got up. When I noticed that it was late at night, I went back to bed. Everything was so strange because I could not remember that I had returned to bed. The next day Marie discovered that the lungs were perfectly fine. She thought of the prayer and the unique light, and she realized that she must have been healed. -After this I have never used asthmatics and the lungs have worked well. When I went to the doctor, he said, "Your lungs have become so nice!" I told him that I had received prayer. "You have? That's good, " the doctor replied. Family and friends have all seen Marie's great change. She has told her about the prayer, but her experience with the light has she kept for herself. Now Marie can walk without problems. 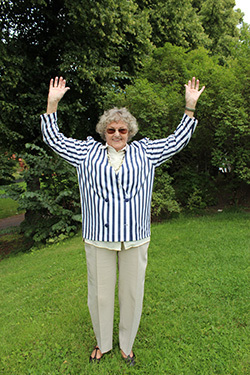 She often attends a retirement dance in Oslo and her body functions well. -Now I can dance without the need for breaks all the time. The first time I went to the dance hall after getting healed, people stared at me with big eyes. I had to ask the manager if there was anything wrong with me. Several said that they did not recognize me. I have invited many elderly to the dance in recent years, and it is fun. Life has changed. I am very grateful for what has happened.